The Vanguard Spirit ED. The most interesting aspect to us — the focus wheel! The Vanguard Spirit ED binocular proved to be an interesting one to use in the field. What was the most interesting element? Perhaps the especially "fast" focus wheel — only about two thirds of a revolution to go from close-focus to infinity! We'll tell you what we thought of it, but let's start this review with a little general information about the company and the binocular. 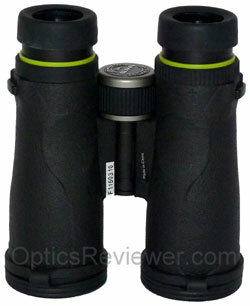 These binoculars are provided by a company that's been providing optics and accessories globally for 25 years. When we met the Vanguard team, we were interested in reviewing a binocular that would provide a good image at an affordable price. We settled on the Vanguard Spirit ED 10X42 for a couple of reasons. For starters, it uses the extra-low dispersion (ED) glass, also called High Density (HD) glass, for its lenses. This glass is made specially (typically, but not necessarily, with fluorite) to reduce the amount of chromatic aberration in a viewed image. The blurring at the edges of the various colors in an image due to chromatic aberration reduces observable details in the image and those details are critical to a good view. The second reason was that the economies of the United States and many other countries have still not recovered from the 2008 recession as we write this and we wanted to concentrate on good, affordable optics. A Vanguard Spirit ED 10X42 was graciously loaned to us by the folks at Vanguard for this review. On one of the first sunny, spring days that we took the Vanguard Spirit Ed into the field, we noticed a number of painted turtles had climbed out of lake where we were and were sunning themselves on the banks and fallen trees. Since painted turtles in that area were not uncommon, we didn't think to pay much attention to them. As the day progressed, though, we found them increasingly interesting as they would quickly slide into the water when we approached. It became a bit of a game to see how close we could get before they would disappear. On a later summer day, when the smaller turtles for the year were becoming evident, we were scouting the water ahead of us with our Spirit ED binocular and found an algae-covered tiny turtle. At that distance, it was invisible to our naked eyesight and we had to work to get closer without it also sliding quickly into the water. Thanks to both the advance notice provided by the binocular and the naivete of young and inexperienced turtles we were able to get close enough to get the accompanying pictures. No sooner than we had gotten the close-up picture and glanced away, however, than the little fellow exited his portion of the stage and we didn't see him again. Yes, the bigger, mature creatures are interesting and capture the attention quickly and easily — but it's the younger ones that seem particularly interesting, isn't it? While thinking about turtles, we also enjoy watching them from the overhead advantage provided by a bridge when we can use a binocular and watch them swim and dive. The binocular allows us to see much deeper into the water on sunny days than we would otherwise be able to see and it's fun to be a part of their underwater lives to that extent. The Spirit ED's frame is made from tough, durable polycarbonate for lightweight strength. At only 22.6 oz (640g) for the 42 mm objective lens sizes, it's a binocular that many will be able to carry without discomfort in the field. A rubber armor is applied to the outside of the binocular's barrels and provides a measure of cushioning as well as making it easier to hold onto the Spirit ED in cold or wet conditions. The armoring on the underside of the barrels does have slight indents to guide placement of the user's thumbs to achieve a balanced grip. This can be a help when using the binocular for an extended period since an unbalanced binocular will cause the hands and arms to tire more quickly than a well-balanced one. We were pleased to observe that the thumb indents seemed to be placed so that our thumbs seemed to naturally land on them. The Spirit ED's balance seemed to make them easy to handle over an extended period and we didn't notice them being particular front-heavy or unbalanced to the back. Overall, the fit and finish of the binocular is good. The hinge is appropriately stiff to hold your interpupillary distance setting well and a standard thread is provided on the front of the hinge to use with a tripod adapter (unscrew the plastic stub that keeps the hole covered). Finally, the size is comfortably compact for easy carrying and handling. Something that caught us off guard was the speed of the focus wheel. Usually, we find focus wheels to require 1.5 revolutions or more to go from close focus to infinity. We find that a focus wheel calibrated to go from close focus to infinity in one full revolution to be about right and to allow for adequate fine-focus adjustment. It is also fast enough to keep ones fingers from becoming fatigued on those days when you're rapidly changing between nearby activities and more distant ones. We found that the focus wheel on the Spirit ED went from close focus to infinity in about two thirds (0.67) of a full revolution. It took us a bit to become accustomed to this speed and to be able to achieve a fine focus to see desired details. Although we did become more comfortable with it, our experience was that it was still not as easy to achieve a fine focus when trying to see details at a distance as a binocular with a full revolution of the focus wheel from close focus to infinity. Because of the especially "fast focus," we recommend the Spirit ED binocular for hunters and others who may value the speed afforded by a particularly fast focus. We don't necessarily recommend it for bird watchers and others who want to be able to see detailed images without fiddling to achieve a "fine" focus. Vanguard has made the Spirit ED binoculars waterproof by sealing the fitted areas with O-rings and using a lubricant that won't disburse (fade away) under normal use. We've not yet tested an assertion about waterproofing with any of the binoculars we're written reviews on because we expect any company will stand behind an assertion like that. If you should find that your Vanguard binocular's waterproofing has allowed moisture inside the instrument, we're confident that Vanguard will honor its warranty. What does it mean for binoculars to be "internally fog-proof"? It means they've had the potentially moisture-laden air replaced with dry nitrogen gas. With the nitrogen in the binocular, there's not enough moisture (if any) left to cause fog on glass surfaces inside the binocular. However, if you take them from a cooler environment to a warmer, more humid environment, you'll still get fog on the outside glass surfaces. Being internally fog-proof is the important thing since moisture inside a binocular can cause a number of problems. The twist-up eyecups provided on the Spirit ED have a good, smooth-as-silk action with an intermediate stop. With an eye relief of 16.0 mm for our 10X42 test instrument (19 mm for the 8X42 configuration), the intermediate eyecup stage was 3 mm and 6mm when fully extended. We found the fully extended eyecup adjustment to work best for us when not wearing glasses and there were no problems with the eye relief being excessive for any of our team members. 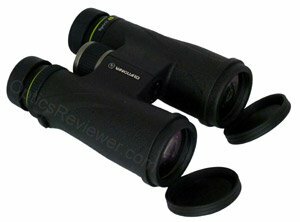 What about the Spirit ED's Rain Guard for the Oculars and its Lens Covers? The rain guard for the eyepiece lenses is made of a smooth, hard plastic-like material. It stays on the twist-up eyecups well, though, because of the softer, more rubber-like feel of the eyecup material which provides the necessary friction. The bridge between the two ocular caps was quite functional for us, although we wondered about its thinness and if it would be durable with use and over time. The covers for the objective lenses are made of a soft, rubber-like material. The ones that came with the Spirit ED we tested were tight enough to stay on the binocular when we were handling it prior to using it. They were loose enough, though, that we removed them so they wouldn't fall off and be lost while using the instrument. Where is the Manufacturing Plant for Vanguard's Spirit ED Binocular? We noticed that the serial number is placed on the underside of the hinge along with a sticker indicating that the Vanguard Spirit ED binocular was made in an optical manufacturing facility in China. What about the Spirit ED's Optical Performance? We were interested to see what we would find in terms of our test unit's optical performance. 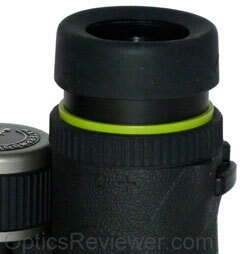 The Spirit ED has fully multi-coated optics and its prisms are made of BaK-4 optical-grade glass with phase coating. The field of view for a Vanguard Spirit ED seemed about average to us. The 10X42 configuration we tested was 314 feet at 1,000 yards (105m at 1,000m). This gives an angular field of view of 6.0° — not bad by any means, but regular OpticsReviewer.com readers will probably recall our penchant for a wide field of view. Our thinking is simply that a wide field of view provides the ability to "see more of the action" — whatever the action might be. This is critical for bird watchers and biologists as well as law enforcement and others. Hunters sometimes say that a wide field of view isn't important to them, but after some conversation (and looking through binoculars with varying fields of view), folks with this perspective are not immune to changing their point of view. 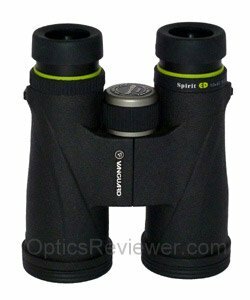 We found the Vanguard Spirit ED test binocular was good in being able to resolve details as well as most others in its price range which use extra-low dispersion (ED) glass for lenses. It's able to resolve details satisfyingly and we believe most users will enjoy this element. The optical sweet spot is the area in the middle of the field of view for which resolution is usually particularly good due to curvature of lenses. Our test binocular gave sharp details from the center to a little more than 50&percnt; of the view's radius. The details started losing their distinctness at around 67&percnt; of the view's radius or, to say it differently, the view started to get fuzzy at about two thirds of the view's radius. That's not to say that you can't still see things in the "fuzzy" area, but rather to say that you may not be able to see the amount of detail you desire at that point. If you're holding the binocular by hand, it's usually easier to accommodate this by moving the binocular to keep the desired view centered and sharply resolved than if you're using the binocular on a tripod. Our problem, as discussed under the Center Focus heading above, lay in achieving a sharply-defined fine focus due to the particularly fast focus design of this instrument. One looks for color neutrality in an image viewed with roof prism binoculars to see what bias may be introduced by the reflective coating applied to the prisms. While it doesn't seem likely that the average user will be bothered by or even notice it, we were able to discern a very slight yellow cast to the Vanguard Spirit ED's view. The Vanguard Spirit ED uses a silver alloy reflective coating on its prisms. The silver alloy coating approach is one of the best and was used in the very best binoculars available for a number of years. Silver, however good it is, doesn't reflect light evenly over the entire spectrum of visible light. The result is that, for the individual who is looking closely for it, a very slight yellowing of the view is presented. Overall, we found the color rendering to be rich and, other than the barely noticeable yellow aspect, balanced. We did not find that chromatic aberration was excessive in the Spirit ED binocular we used, although some was noticeable when viewing electrical wires or roof tops against a bright sky for example. As with any manufactured product, there are bound to be some differences between individual instruments in any given area. We wouldn't expect differences to be significant, however. How does the Binocular do for Low Light Viewing? 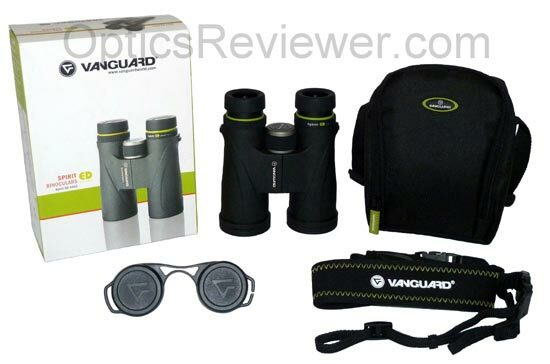 We found low light viewing with the Vanguard Spirit ED binocular to be a solid average for its price category. The silver alloy prism coating is a good one. What about Using in Strong Light Conditions? It was our observation that the Spirit ED binocular's ability to perform well under strong light conditions and control stray light was appropriate for its price range. There is always some variation between individual binoculars. Because of this, we're used to finding specifications being conservatively stated so that any individual instrument will be within the stated specifications. We were surprised when we measured the close focus distance for the Spirit ED binocular provided to us for testing. Vanguard specifications for the 10X42 configuration indicate a close focus distance of 9.2 feet (2.8m). Our measurement showed a close focus distance of 9.9 feet (3.0m). This is more than our recommended close focus distance of eight feet (2.4m) for bird watching binoculars, although it wouldn't be out of line for stadium sports enthusiasts, hunters or a number of other users. The Vanguard Spirit ED binocular's diopter is adjusted by a ring at the right ocular lens' eyecup. It isn't possible to lock the ring, however, once the diopter has been adjusted. The test unit's adjustment ring moved smoothly and without a great deal of resistance. This means that you may find yourself adjusting it more frequently than you would otherwise. It also means it's easier for other people to adjust the Spirit ED for their vision when you let them look at something (that's a nice way of saying you'll need to readjust it when they give it back). The workaround for this is simply to be careful in how you handle your binocular so that you're not unnecessarily brushing the against the diopter adjustment ring. It includes smiling at the friends who adjust the diopter for their own vision! Perhaps it was just us, but we found achieving a fine diopter adjustment was a bit more difficult with the particularly fast focus design used for the Spirit ED binocular (see above). The Vanguard Spirit ED comes with a user manual, rain guard, lens caps for the objective lenses, a comfortably wide neoprene-type neck strap, a lens cloth, and a case. The durable-feeling woven nylon or polyester case has a sturdy nylon strap to thread your belt through so you can carry it on your belt. It also has a cleverly designed strap that's short enough to use as a hand-carrying strap or the design allows the binocular's neck strap to be used as a neck strap for the carrying case. The case is nylon lined and padded with what feels like a layer of closed-cell foam padding. It's front panel has a zipper which allows the U-shaped panel to pull forward from the carrying case. Pleated nylon side panels prevent the binocular from falling forward and out of the case — a nice touch. We believe that people who require a particularly fast focus, such as car racing enthusiasts might, will want to consider the Vanguard Spirit ED binocular. Others, possibly such as hunters, will likely also find it to be of value. To make it convenient to check availability and pricing for Vanguard's Spirit ED, here are links to the Spirit ED selections at major online optics retailers: Amazon.com for our friends in North America and Amazon.co.uk for our friends in the United Kingdom, South Africa, and Australia. What is the Warranty like for the Vanguard Spirit ED? The Spirit ED binocular's warranty is a special one in the Vanguard lineup. 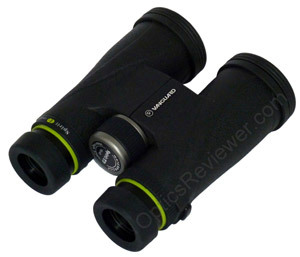 We understand that it's shared only with its Endeavor binocular and spotting scope siblings. This is the Premium Lifetime Warranty and is valid for residents of the United States and Canada (in the USA, complete an Optics Repair/Replacement Request Form and in Canada contact the store where the instrument was purchased). Under the Premium Lifetime Warranty, Vanguard will repair or replace your Spirit ED binocular: "No hassle. No Questions asked." What's the catch? Naturally, it doesn't cover theft or loss of the binocular. It also doesn't cover unauthorized repairs or modifications — if it doesn't work, send it to the company to fix! It's a very good warranty. Outside of North America, Vanguard tells us they provide a limited lifetime warranty and we understand that to mean that the Spirit ED is warranted against defects in materials and workmanship for the life of the original owner. We expect it would be a good idea to keep your receipt to provide documentation that you're the original owner. For additional warranty details as they may pertain to your country of residence, please feel free to double check the Vanguard website.